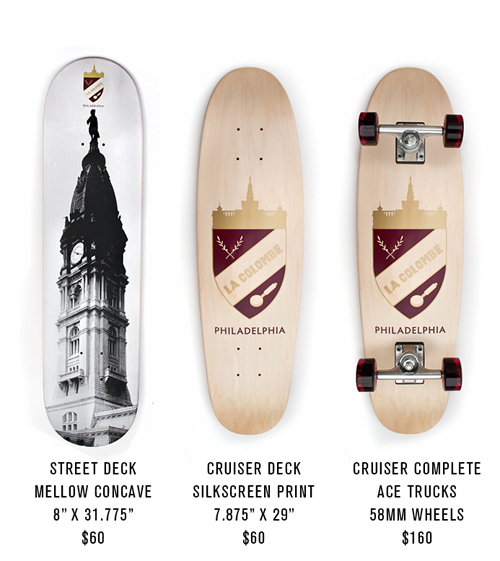 In appreciation of the Franklin’s Paine Fund’s perseverance, entrepreneurialism and community involvement, La Colombe Torrefaction offers 2 limited edition skateboards for sale. 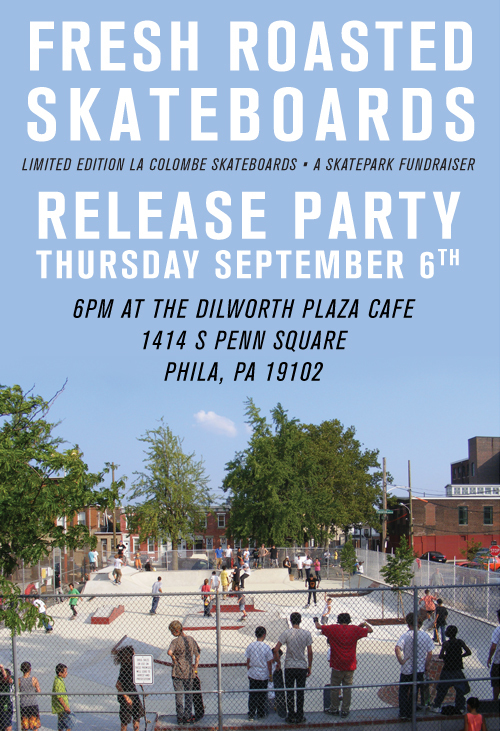 All proceeds go to support Franklin’s Paine Skatepark Fund’s work in elevating the status of skateboarding in Philadelphia, as well as providing vibrant public space and educational programming opportunities to community youth. Franklin’s Paine Skatepark Fund is a Philadelphia nonprofit organization working to strengthen communities and empower youth by advocating for skaters and skateboarding culture, educating youth and adults about the art of skateboarding and its benefits to neighborhoods and people, and building free, public skateparks that demonstrate innovative design, community engagement and multi-faceted use. Franklin’s Paine is currently preparing for a ground breaking on their marquee project, Paine’s Park, a 2.5 acre, multi-use skate plaza to be located along the Schuylkill Banks adjacent to Eakins Oval. Due to the centrality of the site and the innovative design, this project has the potential to attract visitors and events both locally and internationally and will provide much needed designate skate space for the growing number of skateboarders in the region. Formation Skateboards offers limited quantity products created by a network of artists from all over the world. Each and every Formation deck, is crafted in a small batch and will never be reproduced again. Founder Lorenzo Errico passionate about skateboarding and coffee in Philadelphia, splitting his time between Formation and as a barista at La Colombe. Franklin’s Paine Skatepark offers 2 limited edition skateboards for sale among them the cruiser complete ace truck skateboard is good. To organize an auction of the skateboard for the charity to Franklin’s Paine Skatepark is a really very great job.